In the last five years, there has been a massive change in what sales and marketing means. In 20 years of a sales and marketing career spanning vineyard cellar sales and global IT companies, we've observed what works and what doesn't. In the last five years, there has been a massive change in what sales and marketing means. They used to be completely separate functions, but today they need to work hand-in-hand for a company to be successful. Steve has extensive experience leading, coaching and consulting for sales and marketing teams throughout the US and Asia. He has coached and mentored teams at Facebook, Google, Telstra and a number of global companies that operate large, dispersed sales and marketing teams. Steve has developed a clear and simple sales methodology that shifts the sales team thinking from a sales push to an open and honest conversation about the problem the client is trying to solve. When the solution is communicated clearly and the problem is clearly defined, sale cycles shorten and call reluctance reduces. Combine this method with a marketing team that works alongside sales and takes accountability, and sales results will improve dramatically. 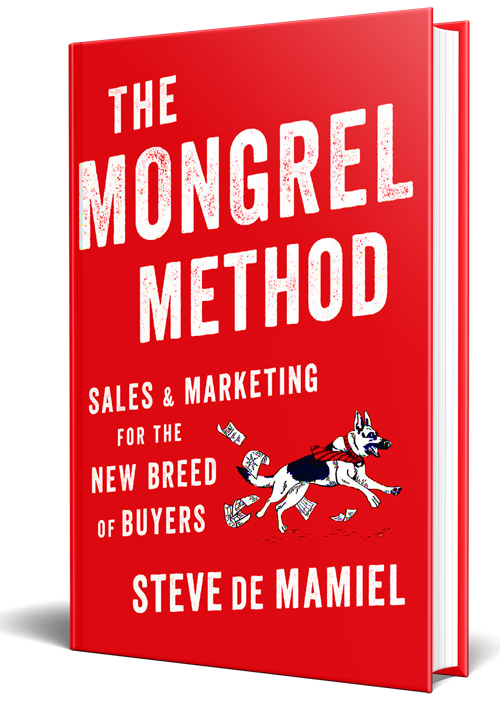 "Steve's training has had an immediate impact on our sales effectiveness"
Inspired by Steve’s years of experience coaching this subject - The Mongrel Method guides you through Steve’s mixed-tactics approach to sales and marketing.